My vintage metal drawers were found and gifted to me by my son. In my favourite colour green ~ the drawers hold all my stamps and stamping inks. Photos I've taken of the Sparrows in our garden can be found throughout. And the sweetest little "love notes" by grandsons hands. My Clair Murray hand hooked runner was a lucky garage sale find! and Archer the sweetest little studio dog ever! 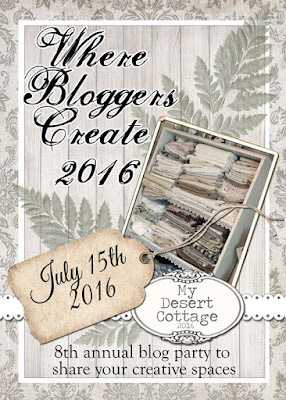 Thank you Karen for hosting Where Bloggers Create again this year ! !